PAKWACH – The death toll of the Sunday accident at Pakwach stands at seven as police marine continue the search in an accident involving a truck registration number Fuso Canter which occurred early morning on Sunday 16 at Lubiri landing site in Pakwach Town Council. The truck which was travelling from Pabbo Sub-county in Amuru District to Panyimur market failed to break with over 20 people and scrap on board, and it plunged into River Nile killing three people instantly. Yesterday a team of marine officers mounted an aggressive search at the accident scene at Lubiri landing site. According to Josephine Angucia police spokesperson for West Nile region, four more dead bodies were recovered and two other victims were this morning rescued from the river. 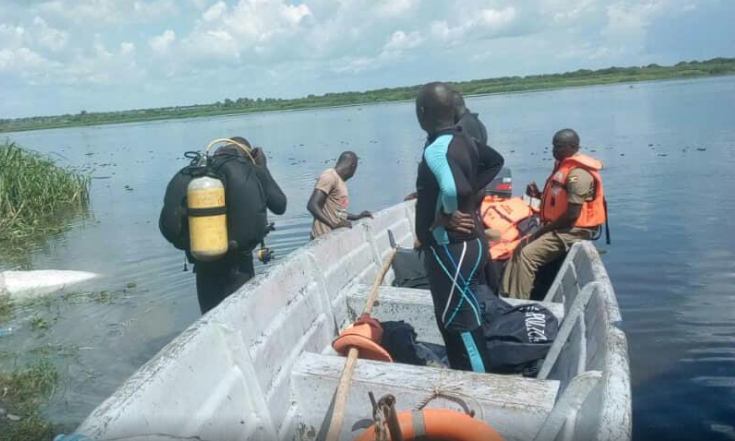 The marine police working with a team from Uganda Wildlife were able to expedite the search managing to save some people. Angucia said a three-year-old child was discovered alive today morning stuck in between the papyrus on water and was handed to her mother after a medical examination. She said the number of people on the truck may have exceeded 20 as earlier reported since two more people are said to be missing. One of the deceased has been identified as Nancy Auma a resident of Pakiri in Lamogi Sub-county according to her National ID. So far 14 people have been rescued and all bodies have been sent to Pakwach Hospital pending post-mortem.